Catherine just wants her family to be normal, but her brother, David, has autism and just can't seem to keep all the many rules that Catherine has made for him. She loves her brother, but she's also tired of feeling embarrassed by his actions. Then, that summer she meets two new friends--a girl her age that has just moved in next door and a disabled boy who goes to the same therapy as her brother. As these friendships develop, she learns some unexpected things about herself and others, and begins to ask herself if being normal is what's most important after all. Children and adults alike really enjoy this book! It's the kind of book that you don't want to put down. And it won several prestigious awards, including the Newbery Honor in 2007 and the American Library Association Notable Children's Book honor. There is clearly a lesson in this story, but it's subtly conveyed, never preachy. Lord does an excellent job of compassionately portraying the conflicted emotions of the main character. Her protective instinct and love for her brother is evident, but so is her desperate wish for him to just be 'normal'. We give this book 'two thumbs up', for adults and middle grade readers alike. 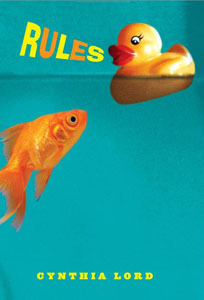 School Library Journal called Rules "lovely, warm read, a great discussion starter." You could either give them a handout with a set amount of squares on it, or have them make cardstock squares (like the character in the book did) and then glue them down on a paper.